9 months ago 7 of us booked a flight to Bangkok during the Air Asia free tickets promotion. Ahh and last week the wait was finally over and now it is history. Only 5 of us could make it to Bangkok consisting of my sis’ colleague, ex-colleagues and friends. 2 more friends join in with us as their flight is only 2 hours earlier. Together 7 of us embarks on a journey of shopping extravaganza, hunting down temples, meeting friendly Thais and uhhh 1 unfriendly one, savouring Thailand’s mouth watering dishes and cruising on the beautiful Chao Phraya River. Yes Bangkok is indeed City of Angels. 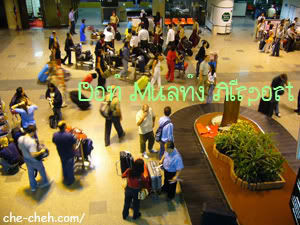 Touchdown at Don Muang Airport around 8.30pm some 30km away from Bangkok city center. The Air Asia’s Airbus 350 aircraft that we boarded was only 2 days old thus the leather seats smell made all of us feel like boarding a big expensive aircraft. This is the arrival hall baggage area. Don Muang Airport is something like Sultan Azlan Shah Airport in Subang, aging gracefully but Don Muang Airport is very long. When you come to Bangkok now, you will most probably be arriving at the new Suvarnabhumi Airport. After many minutes of discussion and consideration we (5 of us) decided to travel by airport bus to our hostel. It cost us 100Baht (~RM10) per person throughout a single journey. 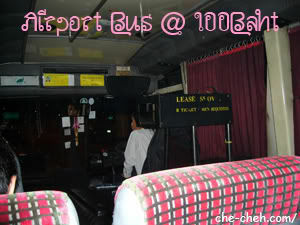 We were lucky because one of the airport bus routes is to Sukhumvit area where our hostel is situated. What makes me even happier is that the bus driver stopped right in front of our hostel at Sukhumvit 25 instead of Sukhumvit 23 (the normal stop). Thank You bus driver. Hehe. I was practically blown away when I saw the hostel that we are going to spend the next 3 nights in. I even asked my sis whether this is INDEED the hostel that I’ve booked. It is squeaky clean, new and cosy. At 1,000Baht per night (~RM100) what more can you ask for for a hostel. Yes it even comes with a TV, fridge, closet, private bathroom, air-cond and 2 complimentary breakfast. After we had refreshed ourselves, we head out to 7-11 around midnight for a light supper before turning in for the night. Yawnnnnn. 7-11 is very popular in Bangkok. You can find 7-11 practically every few blocks. p/s: Congrats to M.Schumacher!!! What a stunning Chinese GP that was. Boooooo Alonso! wuah! indeed very nice hostel! part 2 please! can’t wait for part 2 of you review! Wah … can’t wait to hear where u been to on the subsequent days. How, itu itenary ada jalan ka ? Wuching, yup like HOTEL hor. Did you see Alonso’s face at the podium ? Kuat jealous man! Jemima, ya can say it’s quite near some main shopping district but still you need to travel by lrt.